There is nothing like a homemade ornament to make your Christmas tree special. 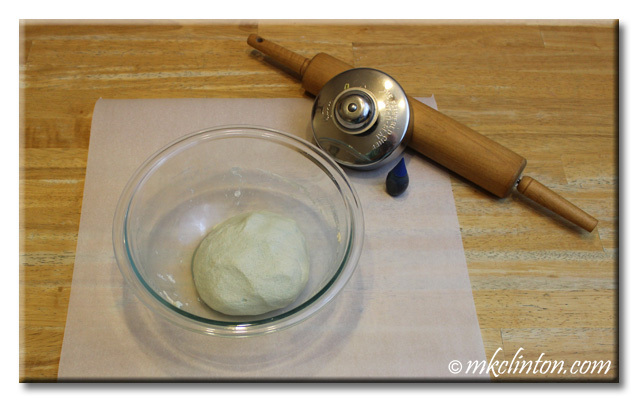 I wish that I had made this easy salt dough recipe years ago. I would have captured the paws that have left their prints on my heart. It was fun making these and I think next year, we will add food coloring to make some in red and green ornaments along with some festive ribbon. These are going to hang in our BFTB office all year. Combine flour and salt in a bowl and stir together. Add water and mix until you can form a ball. 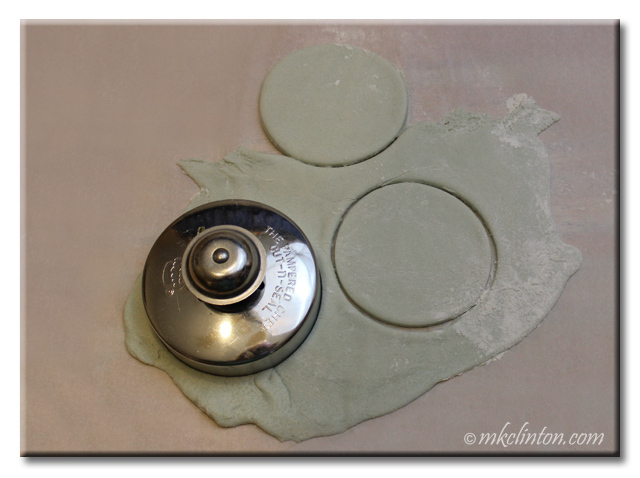 Use a floured rolling pin to flatten dough to approx. ¼” thickness. Use cookie cutter/cup to cut out a shape. Christmas shapes would be cute but need to be large enough for your pet's paw. 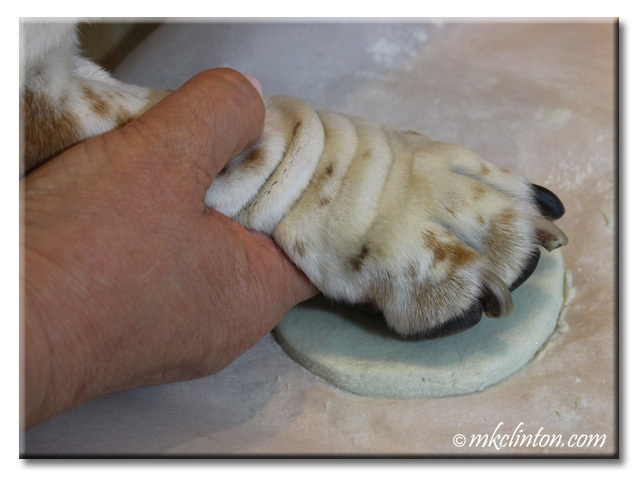 Gently press your dog’s paw into the dough shape. 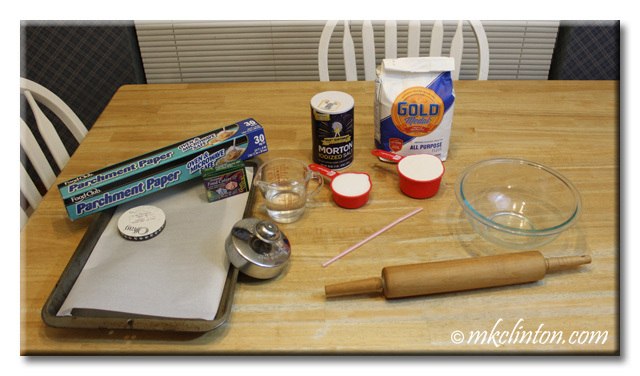 Use a straw to make a hole for your ribbon before baking. 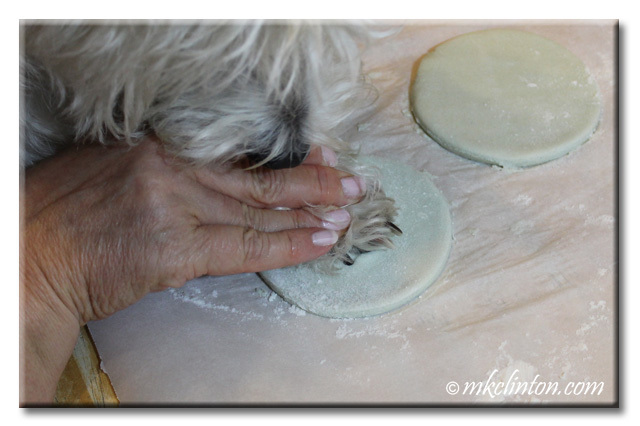 Let salt dough paw print cool completely. Thread ribbon through the “straw” hole and tie a bow. 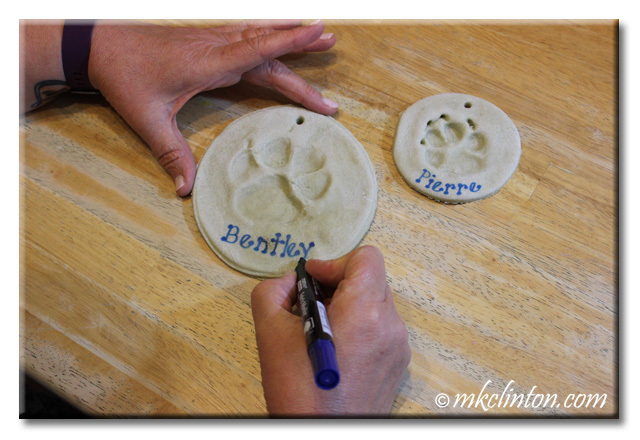 Use a paint pen to write your dog’s name on your ornament. Add Christmas and the year on the back. 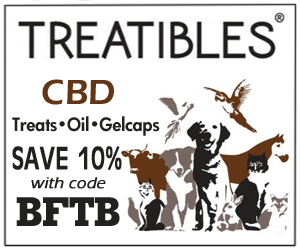 I am an affiliate for Treatibles. If you purchase with my code, you will save 10% and I will receive a small commission. Thanks in advance! It is the time of year for miracles so we have our paws crossed. You are so funny! BOL! We are happy that you liked your card. Yours was furbulous! We were thinking about making these and doing a post the other day, but then Mom decided she would rather make cookies. They look very nice! Your cookies looked yummy! Mom saved the recipe. I love this! We have an ornament with our first dog, Pip's paw print. Each year it is so fun to find it and hang it on the tree. Makes us feel like he still with us. 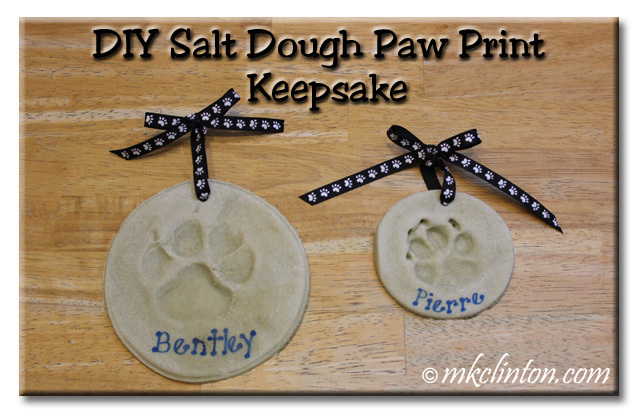 We still have our Rainbow pets' ornaments but I'd never made the salt dough paw prints. I look forward to hanging our keepsakes each Christmas. Pierre doesn't like anyone messing with his feet (pedicure hater) so he wasn't too sure about it. I will treasure these. That sounds like a fun project! Thanks! It is fun and a great way to make a keepsake. What a fun and awesome project! Thank you for sharing! This would be fun with your gang! We love this idea and like you wish we had done this years ago with dogs that are still in our hearts. I really do wish that I had my Rainbow pets paw prints. We still hang their ornaments on our tree. Thanks! I have them on the wall of our office all year. They are so cute. YES! I will definitely make one with her. Thanks! I used to pass right by anything that was DIY - LOL! But now I'm trying to be more creative since I'm trying to make different things to sell at the farm. These look really great, and are definitely something I could handle! What a great keepsake. They are super easy and turn out really cute. Those are great! And it looked pretty easy. We may have to try that next year. They are easy and you can use Christmas cookie cutters and the cats' paws would fit in the shape. Bentley's were too big. I should do that for my pups. I am so glad that I finally made these and they are so easy! What a wonderful project! Thank you for sharing it here. We will try it for next year! I love these! Thanks so much for sharing this DIY project. I'm going to try it this year! I’ve made these, easy and fun. What a great idea! Yours are way too adorable.